Patrick Comerford: Was the Bishop of Ossory the first Irish tourist to visit Rethymnon? Irish tourist to visit Rethymnon? The “Grand Tour” was considered an essential part of the education of young aristocrats and gentlemen from Ireland and England in the 18th century, and included parts of present-day Italy and Greece. Their letters home were probably the equivalent of later postcards, texts and Facebook postings, their journals the equivalent of blog postings, and the plundered antiquities they brought back with them have been replaced by today’s souvenirs and tourist trinkets. They probably behaved no better than the Leaving Cert students behave in Malia and Hersonissos, but they also reached other parts of Crete. I wonder whether the first tourist to visit Rethymnon was Richard Pococke (1704-1765). He was an 18th century Church of Ireland Bishop of Ossory (1756-1765) and briefly, before his death, he was Bishop of Meath (1765), but he is best known for his travel writings and diaries. Pococke was educated at Corpus Christi College, Oxford, but his family connections brought him back to Ireland and he advanced rapidly in the church, becoming Vicar General of Waterford and Lismore. He seems to have spent far more time travelling than attending to his duties as a priest or bishop, with his cousin Jeremiah Milles (1714-1784) he was engaged in two “Grand Tours” from 1733 to 1741. His first tour (1733-1734) was to France and Italy and the second (1736-1737) was to the Low Countries, Germany, Austria, Poland and Hungary. The first tour ended when Milles decided to return to Ireland in order to be ordained and accept an appointment as Treasurer of Lismore Cathedral. The appointment was an example of the prevalent nepotism of the day – the two young travellers were nephews of Thomas Milles (1671-1740), Bishop of Waterford and Lismore. The second tour also came to an end when Milles returned to Ireland in 1737 to look after their uncle, Bishop Milles of Waterford and Lismore, who died three years later. But Pococke was resolved to continue his journeys to the East, and detailed accounts of his travels have been published recently in three volumes edited by Dr Rachel Finnegan of Waterford Institute of Technology, who once taught me Classical Greek in Trinity College Dublin. Pococke’s letters and diaries include detailed accounts of the ceremony in Venice known as the “Marriage to the Sea,” and descriptions of contemporary music and opera. From 1737-1741, he toured the Eastern Mediterranean and the Middle East, visiting Lebanon, Egypt, Jerusalem, Palestine, Asia Minor and Greece, including the islands of Crete, Rhodes and Chios, and Athens, Thessaloniki and Corinth on the mainland. Pococke was one of the first European travellers to give an account of the origins of the Achtiname of Muhammad, a mediaeval Arabic document that claims the Muslim Prophet Muhammad personally confirmed a grant of protection and other privileges to the monks of Saint Catherine’s Monastery on Mount Sinai in Egypt. From 1747 to 1760, Pococke travelled throughout Ireland. Meanwhile, in 1756 he was appointed Bishop of Ossory, and shortly before his death he became Bishop of Meath in 1765. He died of apoplexy in 1765 while he was visiting Charleville Castle, near Tullamore, Co Offaly, and was buried at Ardbraccan, Co Meath. After his death, many of his manuscripts were given to the British Library. Although the socialite Mrs Delany described Pococke as “the dullest man that ever travelled,” I am interested this week as I walk through the backstreets of the old town of Rethymnon amd visit its churches and former mosques, in the way Pococke described his visit to this part of Crete in 1739. Although Pococke spent much of his time in Crete in 1739 in Chania and Kissamou, he also visited Rethymnon and Iraklion. In Rethymon, he noted that the town had 500 Christian families and six or seven Jewish families. Outside Iraklion, he came across the legend that Caiaphas died in Crete, a story first mentioned in the apocryphal Gospel of Nicodemus. There, in the accounts of the life of Pilate, it is said that in the 23rd year of the reign of the Emperor Tiberius, Pontius Pilate and the High Priest Joseph, also known as Caiaphas, were summoned to Rome to give an account of their administration. On the journey, Caiaphas fell ill and died, and he was buried near the Minoan city at Knossos. His supposed grave is said to have given its name to a village called Casal Cagiafa, south of Iraklion. Pococke mentioned the legend, but wisely left the attribution to Caiaphas to the local people. All that remained of the legendary grave was destroyed when a new road was built in 1883. The beautiful resort of Bali, close to the main road connecting Rethymnon to Heraklion, is a popular destination for tourists. I passed through Bali on Friday night, but this part of Crete was isolated until 1970, when a new road was built. Pococke was the first writer to mention the name Bali (Bal Monastir), when he visited the Monastery of Attali or Bai in 1739. The monastery is built over the hill of Agia Ypakoi, west of Bali, and has panoramic sea views. The monastery of Bali is a male monastery dedicated to Saint John the Baptist. The complex is built in two levels. Next to the impressive entrance of the monastery there were stables, while visitors can still see the old mill, a pottery workshop, a bakery, the monk cells and the refectory, which is decorated with frescoes. In the 19th century, the bay in Bali was one of the key points for supplying the rebels in Crete with ammunition and for communicating with liberated Greece. Between Bali and Rethymon, Pococke also visited the area around the villages of Hamalevri, Pangalochori, Stavromenos and Sfakaki which boasts important archaeological sites. Pococke identified the area as being identical with the classical site of Pantomatrion. In 1918, Efstr Petroulakis, the curator of the Museum of Rethymno, initiated a first experimental research in the village of Paleokastro. In December that year the antiquarian Emmanuel Kaounis discovered a magnificent marble tomb stele dating back to the 5th century BC and bearing an image of a young hunter. In the years that followed, archaeological findings were often brought to light in a haphazard manner in this area. Further excavations carried out since 1990 have uncovered extensive buildings that were parts of the city and workshop on two hills, Tsikouriana and Kakavella, south of the village of Stavromenos. All the findings are now on exhibition in the Archaeological Museum in Rethymnon. Pococke was ahead of his time. He was in Rethymnon almost a century before Robert Pashley visited Crete in 1834. Two generations later, the English writer and artist Edward Lear visited Crete 150 years ago in 1864, and painted five watercolours of Rethymnon, and one of the neighbouring village of Perivólia. But Lear appears to have looked down his nose at the town and described it is a “very small place,” not knowing how long he should bother to stay. Today, Stavromenos is an extension of the resort that spreads along the sandy beaches east of Rethymnon, and the “Grand Tour” has given way to the grand tourist season that begins in May and ends in October. 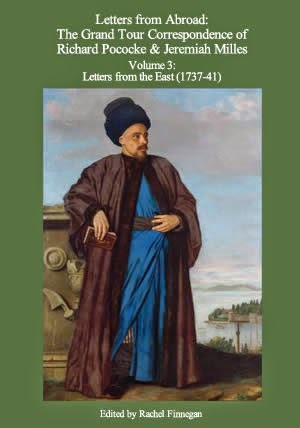 Letters from Abroad: The Grand Tour Correspondence of Richard Pococke & Jeremiah Milles, vol 1, Letters from the Continent (1733-1734); vol 2, Letters from the Continent (1736-37); vol 3, Letters from the East (1737-41), ed Rachel Finnegan (Piltown: Pococke Press, 2011, 2012, 2013).